Here's my theory about why left brain/ right brain theories which overreach won't go away. First up, people love to describe themselves as either left brained (logical, mathematical) or right brained (creative, artistic, wholistic). Why? Because that provides a convenient biological explanation about why they are good at some things and not good at other things. "I can't learn this because my brain won't let me". That has a nicer feel to it than "I can't learn this because (a) I can't be bothered (b) it's not important to me (c) some other reason". Secondly, people worry about the state of the world: economic inequality, wars, environmental catastrophe, crappy politicians, insanity / delusions, apparent failed alternatives in other social forms that temporarily deluded millions (eg. communism), suicide bombers, 9/11, religion etc. Well, to explain all this requires a lot of hard thinking and it is embarrassing to be a member of the human race given the reality that we are collectively quite immature and still working out how to govern ourselves in a semi competent fashion. So, it's reassuring to have a biological theory that the left brain and right brain are somehow out of sync or causing us to focus on the wrong things rather than doing the hard work of actually figuring out the real factors that determine our social development. So, that's my theory of why left brain/ right brain theories which overreach won't go away. Reception to the above book as documented by wikipedia. Mostly very positive reviews by influential people, with the notable exception of The Economist. 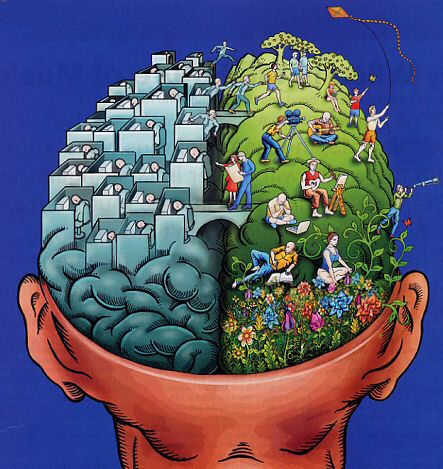 The human brain: Right and left. The Economist review, which is the one I like. The two hemispheres of the brain look so alike that they were long assumed to be identical. Then it was found that after those cross connections are destroyed, usually only the left brain can recognise or speak words, and only the right brain can draw pictures. More recently, when modern methods found other differences between these two sides, it seems to me that some psychologists went mad - and tried to match those differences to every mentalistic two part theory that was ever conceived. Our culture soon became entranced by this revival of an old idea in modern guise: that our minds are meeting grounds for pairs of antiprinciples. On one side stands the Logical, across from the Analogical. The left side brain is Rational; the right side is Emotional. No wonder so many seized upon this pseudoscientific scheme: it gave new life to every dead idea of how to cleave the mental world into two halves as nicely as a peach. Yes, some psychologists went mad, and some are still going mad.